X-FIT TRAINER is a pre-workout supplement specially formulated to enhance your HICT workouts… and help you feel stronger, push harder and train faster than ever before. TRAINER is fortified with clinical doses of research proven ingredients such as beta-alanine, creatine, natural methylxanthines, a sustained calorie burning thermogenic blend and a specialized adaptogenic called CortiFit that reduces the catabolic hormone cortisol. Combined together within the revolutionary TRAINER Pre-Workout Formula, these clinically dosed actives allow high intensity cross-trainers to exercise harder, be stronger, build muscle faster and burn calories longer. 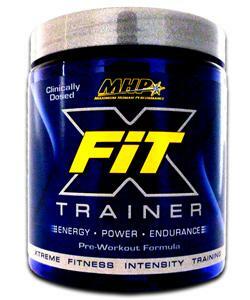 TRAINER is also Banned Substance Free, so it’s perfect for athletes. Increase energy levels up to 79%. Improves mental focus & maximize workout intensity. Increase muscular endurance & increase lactic acid buffering up to 35%. Boost strength gains up to 45%. Lower cortisol up to 24% & promote lean muscle mass. Reduce body fat by burning up to 12% more calories for up to four hours after your workout. **Does not contain any substances banned by World Anti-Doping Agency (WADA). CortiFit is protected under US Patent 6,713,092. X-Fit PowerNow that your workout is over, what’s next? Unfortunately, great results don’t come from just one great workout. 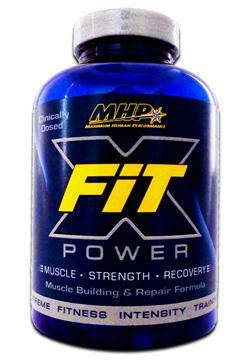 That’s why MHP developed X-FIT POWER, the ultimate 24 hour muscle building and recovery formula. HICT workouts are brutally taxing on your body and if you don’t recover in time for your next workout you won’t be at your best. The active ingredients in POWER (HICA and DAA) are clinically proven to fight off DOMS (delayed onset muscle soreness) and boost testosterone levels to help activate muscle building, so you can be fully prepared to conquer tomorrow’s workout. X-FIT POWER contains no substances banned by WADA, so athletes can be confident in its powerful muscle building and repair benefits. Patent pending clinical dose of HICA and DAA. Reduce delayed onset muscle soreness (DOMS). Increase testosterone levels up to 42% in just 12 days. Improve exercise performance & speed recovery. Gain lean muscle mass & boost muscular strength.